The Haitian elections were a spectacular failure last year, and the United States has all but given up, removing much-needed funding. Although 33 million dollars represents a paltry amount compared to what will be spent on humanitarian aid should the political crisis continue worsening in the absence of successful elections, US State Department spokesman John Kirby simply said that the US hadn't planned to fund two elections, leading some observers to speculate that Washington would help select Haiti's next leader utilizing extra-democratic means. The prospect of political instability or of seeing Guy Philippe installed as regent of Haiti, combined with a worsening drought that has seen famine increase at astronomic rates over the past year, convinced the Dominican Republic that it faces the very real prospect of a civil war on its border that could spark a refugee crisis the likes of which Syria's bordering countries only know. Mr. Philippe -- who came to prominence after leading an invasion army from the Dominican Republic which overthrew, at the behest of his handlers in Washington, the democratically-elected government of Jean-Bertrand Aristide -- currently enjoys immunity from charges of raiding a police station due to his status as a senatorial candidate, a status which he has exploited to systematically disarm what's left of Haiti's police forces. Very soon, Mr. Philippe will have a monopoly on weapons, and he knows that it would be beyond the United Nation's mandate to pursue him should he choose to wage an insurgency or overthrow the interim government. Mr. Philippe is currently the subject of a Drug Enforcement Agency probe, and should he not rise to power, he faces the very real prospect of extradition to the United States, especially if a democratic government is elected which is favorable to Mr. Aristide, the man he ousted from power. The US controls Mr. Philippe through the DEA, and Secretary of State John Kerry is well aware that he is the man with whom Washington can work. 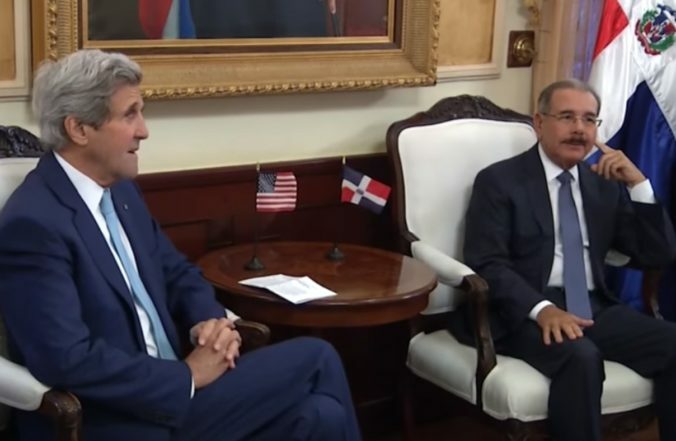 This past July, the Dominican government was slated to begin deporting 142,000 individuals to Haiti, a process which was immediately halted after Mr. Kerry sat down for an hour-long conversation with President Danilo Medina. Despite intense media pressure, Mr. Medina refused to disclose exactly which threats were made by Mr. Kerry, but the staunch constitutionalist soon found himself halting the execution of a decision by the country's top constitutional tribunal, a decision which forced his hand when it came to deporting undocumented foreigners. Publicly using the fear of a great upcoming calamity in the face of America's absence, President Medina now knows that Washington has put the weight of the island of Hispaniola on his shoulders, and he has thus tasked the Dominican government with organizing Haiti's upcoming plebiscite. Mr. Medina is a master when it comes to getting his candidates to positions of power, and this time he can't afford to fail. Should Mr. Medina manage to successfully install a president favorable to his interests, he may yet manage to adhere to his immigrant "regularization plan." Should Mr. Medina fail in shouldering the weight of Haiti's elections, Mr. Kerry's warning that Mr. Philippe could rise to power may come to fruition, bringing with him a rebel government that will not only prevent the repatriation of undocumented Haitians from the Dominican Republic, but may very well wage a war to solidify its power, a war in which refugees will be weaponized.